And the award for best department store in a starring role goes to ... JCPenney! While Macy's, Kohl's, Sears and many other big retailers reported lousy results for the holidays due to unseasonably warm weather and competition from a company named after a river in South America, JCPenney has staged an impressive turnaround. JCPenney (JCP) reported same-store sales growth of 4.1% in the fourth quarter and predicted another 3% to 4% jump for all of 2016. The stock surged 15% Friday and was up another 6% Monday. Shares have now soared more than 50% so far this year and are near their highest levels since October 2014. It is an amazing rebound for JCPenney -- a company that not that long ago appeared to be on death's door. There was the disastrous tenure of former CEO Ron Johnson, who banned promotional sales and offered free haircuts to kids. The retailer had a nasty fight over Johnson's replacement with shareholder Bill Ackman -- who has since sold his stake. Analysts rushed to cut their price targets on the stock, with one slashing it to $1 in 2013. JCPenney was close to becoming a penny stock. Bankruptcy rumors swirled. Johnson's replacement Myron Ullman -- who left the company to make way for Johnson in the first place -- got the company's turnaround started. He wisely chose to refocus the company on popular private label brands that Johnson tried to kill off even though customers loved them -- things like St. John's Bay, Arizona jeans and Stafford. But Ullman ultimately failed to excite Wall Street as well. That's all in the past now. JCPenney hired Home Depot (HD) veteran Marvin Ellison in October 2014 and the company has kicked it into an even higher gear under his watch. 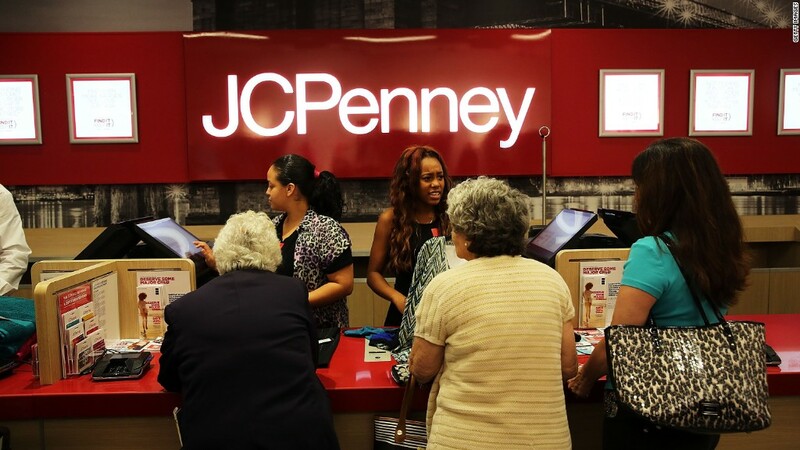 JCPenney has stepped up its investments online to better compete with Amazon (AMZN). Ellison has continued to emphasize the private label brands. The company even recently announced a "Penney Days" promotion -- select times of the year when certain private label items will literally cost a penny. It has been touting this aggressively on social media with the hashtag #SoWorthIt. JCPenney also has just started to sell appliances again, a move that analysts feel will put a lot of pressure on struggling rival Sears (SHLD). Ellison said in a conference call with analysts Friday that the decision came following a "failed search" analysis. The company asked customers what products they were looking for on JCPenney.com that they couldn't find. Appliances was at the top. "We're trying something different. We're actually listening to the customers," he quipped. And the company is changing up its marketing strategy. It had been the exclusive retail sponsor of the Academy Awards for the past 14 years but JCPenney was nowhere to be found on Sunday. That's because it decided to end its relationship with the Oscars. Kohl's (KSS) took its place. During the conference call, Ellison said that the company's previous marketing campaigns were "outdated" and needed to be more modern. He plans on focusing even more on social media and online search. "As we all know, that's a more efficient way to communicate and it's less costly than traditional print or TV," Ellison said. JCPenney still has a long way to go before it has fully recovered, however. But it's on the right track. The company continued to lose money last year, although it bled less red ink in 2015 than a year earlier. Wall Street expects a smaller loss again this year and analysts are forecasting a return to profitability in 2017. So while competitors like Macy's (M) and Sears continue to lose customers and try and convince Wall Street that layoffs and real estate sales are the cure for their ills, JCPenney is quietly just doing what good retailers do -- convincing people to come shop.